To many Pinoys, the mere looks of a tikbalang is very terrifying. 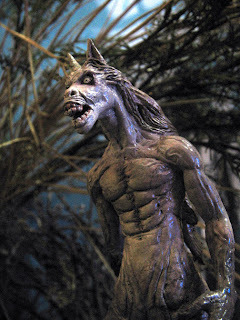 Imagine meeting a tall, well-built man with the head of a horse and horrible teeth. Maybe the teeth went bad because of smoking all those cigars. Even I find it really creepy and the thought of encountering one is frightening. It is said that the creature's legs are extremely long when it sits, the knees levels with the head. Inspite of its scary description, the tikbalang is never violent. 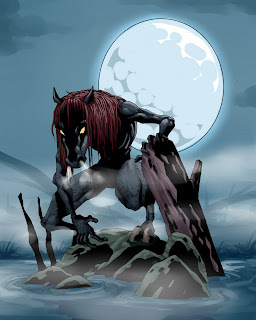 Meeting one spells out only two things, the creature's submission to you or the creature making you lost. Beware when you are traveling, never get separated from a group. Even as a group, the tikbalang may still make you lose your way. The way they do it, they exhaust and confuse the traveler. It has also been told that the creature sometimes kidnaps children and keep them deep in the forest. For what purpose, I cannot say. One thing for sure, they won't be eating those kids. But there are some benefits if you happen to run into a tikbalang. Get three strands of the creature's mane or ride the beast to exhaustion, and it will obey you. That wouldn't really be very easy because a tikbalang itself can rob a man courage just by the mere sight of it. For those who don't run out of warrior-like bravery, the hairs or the joy ride could be challenging as the tikbalang can ride into the air and go really really fast. If one somehow succeeds, the loyalty of a magical beast of burden becomes the reward. There was a story of a man who succeeded overwhelming the tikbalang. He never worked in his farm and the beast did all the toil and hard labor for his master. Fail on making the tikbalang succomb, insanity or death will strike. Right now, since not everyone is doing hard labor and farming, we might have run out of reasons to capture or befriend a tikbalang. Besides, have you noticed that "umuulan ng may araw" don't occur frequently anymore? It just means one thing. There has been less and less "tikbalang na kinakasal" happening. An indication of their dwindling population. Or maybe that's just the case in the metropolitan cities. Perhaps in the rural areas its a different case. Essentially, it doesn't matter if these are true or not. It is their extinction from the Filipino culture that's a concern.